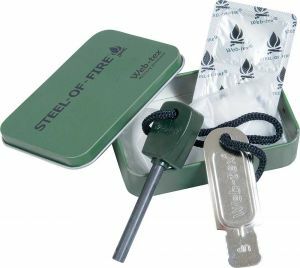 It works on the principle of flint, while hitting two metal parts produced sparks and used to ignite fire.Expedient for hunters and hikers, and everyone got into extreme situation.Works in all conditions! Kit includes 2 pieces of dry alcohol, 2 cotton balls and flint and steel itself. All this is placed in a waterproof tin box in the olive.